‘Is it? Isn’t it? I have skipped a period, nights are restless, but I’m not old enough yet! Am I pregnant or has it really started?’ A whirlwind of thoughts with no one to turn to, to share them. Discussing this delicate matter with friends or relatives may feel awkward. Sometimes, we even feel awkward discussing this with our GPs or other healthcare professionals. The days of grinning and bearing it are on the way out. There are no prizes for martyrdom. Talk to your healthcare professional if symptoms persist. Natural midlife changes start when your periods become irregular. Peri-menopause refers to the time leading up to menopause when the cycle length and menstrual flow can vary significantly. The gradual decrease in the production of oestrogen in the ovaries during this time is simply the body’s natural evolution from the fertile, child-bearing years to a whole new stage of life. If you are in your 40s, or sometimes even earlier, you may have started to experience some of the normal and natural changes that signal peri menopause. The time between periods can shorten or lengthen, the periods can become heavier or lighter. The fluctuations in the hormones can produce a host of symptoms, which can last up to several years. Peri menopause can best be summed up as the time when your body gets ready for menopause. At menopause our oestrogen and progesterone levels become quite low. It is during peri menopause that our body gets ready for these new, lower levels. Every woman is unique, as is her experience of menopause. If you are unsure about the changes you are feeling, the best thing is to speak to your healthcare professional, who can help you clarify some of these changes and suggest the best way to ease symptoms you might be experiencing. Premature menopause is defined as the onset of menopause before the age of 45. It affects one in every hundred women under 40, one in 1,000 under 30 and one in 10,000 under 20. Menopause literally means the last monthly period of a woman’s life. However, it is confirmed when a woman has not had a menstrual period for 12 consecutive months. For most women, menopause usually occurs between the ages of 45 to 55 years and in the UK the average age is 51 years. Oestrogen levels play an important role in a woman’s life. They rise at puberty with the onset of childbearing years and then increase and decrease rhythmically with your menstrual cycle. 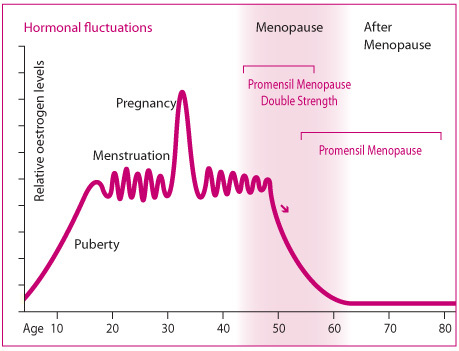 They peak during pregnancy and then decline as you reach menopause and your menstrual cycle ceases (see graph above). The term post menopause literally means ‘after menopause’. Post menopause can be confirmed when a woman has not had a menstrual period for 12 consecutive months. At this stage, tangible symptoms have probably reduced, but now is the time, when you need to start looking after your bones, heart and cholesterol levels. Up until menopause, natural oestrogen provides a protective effect on your heart and bones. As oestrogen declines, it is important to provide suitable nutrients to help keep the bones strong and your cholesterol levels low. For more information about menopause, speak with your healthcare professional.